Vegetables are an integral part of the paleo diet, so it’s important to have creative ways to incorporate them into your meals. Spiralized vegetables can work as a main meal, a side dish, or a colorful and healthy addition to soups and stews—almost anywhere that traditional recipes might call for pasta. Depending on your spiralizer, the amount of trimming required will vary. Be sure to check the recipe for specific instructions on peeling the vegetables and cutting the noodles. 1. Trim vegetable so it will fit on prongs. Secure vegetable between prongs and blade surface. 2. Spiralize by turning crank. 3. Pull noodles straight and cut into correct lengths as directed by recipe. During our testing, we found that vegetables with solid cores were a must for spiralizing—hollow vegetables like acorn squash or very soft vegetables like tomatoes do not spiralize well. We chose noodles that paired well with the other flavors and textures in each recipe; overall, we favored summer squash, zucchini, butternut squash, and carrots. Summer squash and zucchini have delicate, neutral flavor profiles that meld seamlessly with flavorful sauces. They have a pasta-like texture with pleasant chew, and hold their shape nicely once cooked. They are quite easy to spiralize, and they work as short noodles or longer, spaghetti-like strands. Carrots, with their sturdy texture, spiralize beautifully, and make a great base for a side dish where their distinct flavor can shine. Tasters also loved the flavor of butternut squash noodles; their subtle sweetness works well with bold sauces. However, butternut squash is more difficult to spiralize than zucchini and summer squashes, since it is a harder vegetable. We cut off the seed-filled bulbs and reserve them for other uses, spiralizing only the solid necks. Cooked, butternut squash noodles are considerably more delicate than zucchini and summer squash, making it more difficult to get long strands. Although the flavors of zucchini, summer squash, carrots, and butternut squash work best with the recipes in this book, vegetables like beets, celery root, cucumbers, parsnips, rutabaga, and sweet potatoes can also be successfully spiralized. In addition to finding the best types of noodles, we had to test a number of different cooking techniques to find the best way to prepare them. Zucchini noodles tasted great raw in some applications, but most recipes worked best with cooked noodles. Boiling the noodles in salted water didn’t work, since the water later leached out of the noodles and into the sauce. We also tried sautéing, but fitting a full batch of noodles in a skillet was challenging, and even with constant stirring, the noodles cooked unevenly. We liked roasting best: It was easy to spread all of the noodles out on a baking sheet, and the noodles softened evenly while maintaining some texture and chew. Roasting also eliminated excess moisture, preventing the finished dishes from becoming watery. When roasting tender vegetable noodles like summer squash and zucchini, we roast them uncovered for the entire cooking time. This allows moisture to evaporate and results in tender, flexible noodles. We find that draining the noodles after cooking helps to further ensure that we don’t end up with unwanted moisture in the finished dish. When roasting firmer vegetable noodles, like butternut squash, beets, celery root, or sweet potatoes, we recommend cooking them covered with foil for part of the cooking time so that they will steam slightly and become tender. Removing the foil partway through allows the surface moisture to evaporate. Don’t drain these noodles; because they contain less moisture to begin with, they are less pliable once cooked, and transferring them to and from a colander results in unnecessary breakage. If you plan on making spiralized vegetables often, it’s worth purchasing a spiral slicer, or spiralizer. Spiralizers are relatively inexpensive and will save you time in the kitchen—if you buy the right one. There is a wide array of styles available, and we tested several models and found that not all of them work equally well. 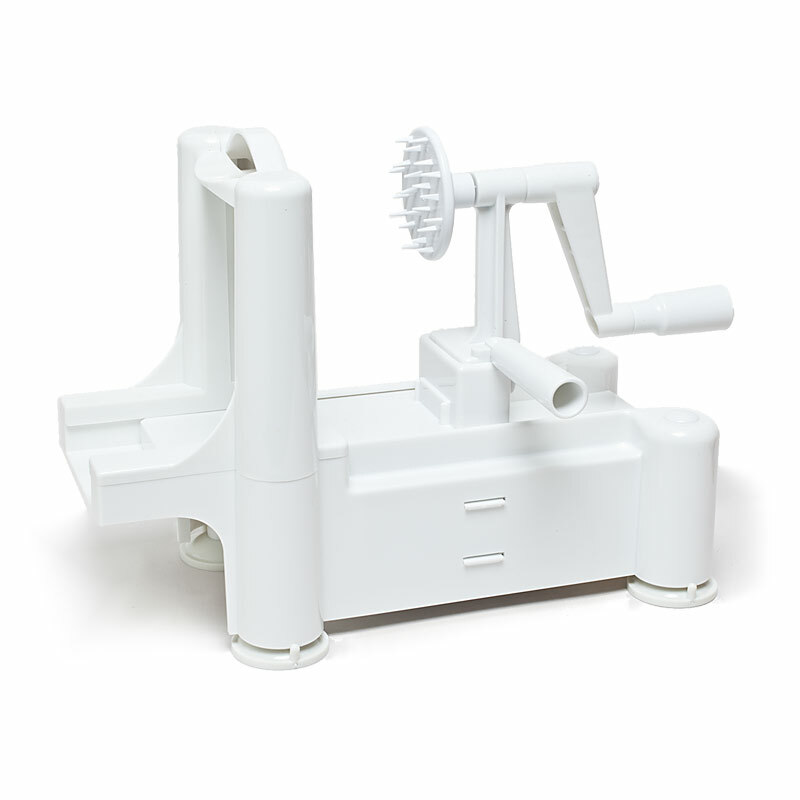 Our favorite model is the Paderno World Cuisine Tri-Blade Plastic Spiral Vegetable Slicer, which rapidly and effortlessly produces mounds of long, thick or thin strands and wide, curling ribbons. It works by holding food on prongs against a cutting blade while you turn a crank; our testers found it easy and intuitive. Its rectangular, 12-inch-long chamber can hold vegetables up to 10 inches long or 7 inches thick. It comes with three blades that store in the base of the unit and sets up in seconds. What If You Don’t Have a Spiralizer? If you don’t own a spiralizer, you can also use a mandoline or a V-slicer fitted with an 1/8-inch julienne attachment. Make sure to position the vegetable on the mandoline vertically so that your noodles are as long as possible. Our favorite mandoline is the Swissmar Börner Original V-Slicer Plus Mandoline, which cuts effortlessly and produces stunningly precise results. Although it’s a little bit less efficient, you can also use a julienne peeler to create decent vegetable noodles. We do not recommend cutting vegetable noodles by hand. Ready to spiralize? Try our recipe for Zucchini “Spaghetti” and Meatballs.